I don’t usually analyse my own work but the questions I’ve been asked about the symbolism of my muslin figures has prompted me to do so. 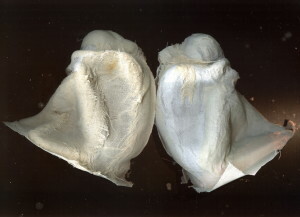 The original acrylic figure from which the muslin copies were made is in a protective pose, her arms wrapped around her knees, her head buried in her arms. The acrylic is transparent and allows the light to pass through her. I don’t know where the idea came from to make copies of her – probably it followed on from other things I’ve done with muslin. But mostly it was a response to the ongoing distressing news of the violence done to girls and women all over the world. Fabric is analagous to skin and none more so than delicate muslin. I tore it into strips and glued these onto the acrylic figure with PVA. In order to release this ‘mould’, I had to cut the muslin up the back. Even then it was very difficult to prise off so that once I’d succeeded it hardly resembled a human shape at all. But then I pressed it back onto the figure and removed it the next day when, to my amazement, the muslin held its shape. Quite intuitively I decided to stitch the back opening the way a surgeon would repair a wound, with black sutures. 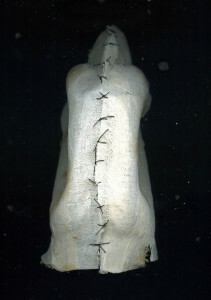 This I realise is clearly symbolic of the hurt done to women, of how many are broken and fractured by their situation. And yet I don’t feel that I have made a victim. At this stage I am now very connected to this fragile object I have made and my actions have moved from intuitive to intentional. My intention is that the sutures are not shameful to her but to the people who inflict wounds on women and to a society that allows such things to happen. I do not see her as burying her head in shame or despair but rather in a pose of self-contained sadness. The muslin has quite ragged edges and is translucent in the light so one can see the criss-cross of the strips, like the fragments of a life lived. She is small, fragile, hollow and light as a feather, as if she could float away to a less troubled place. I have made ten of them so far, each one different to the last; each one unique, as in life. They look stronger in a group, something I suppose we’ve always known, that there is strength in numbers.